Computer Tutoring – Are you interested in mastering Microsoft, becoming a social media ninja, or just figuring out how to feel more comfortable with technology in general? We offer weekly hour-long computer tutoring sessions that are custom-designed to your specific needs, and which grow along with you. For only $40 per session, you can go from n00b to nerd faster than you can name all of the Star Wars sequels! Computer Repair – If you are having difficulty with a sluggish or malfunctioning computer, contact us for rates for diagnosing computer issues and getting you back up and running again! Curriculum Design and coaching – Make your time relaxing by the pool productive by allowing us to custom-design a curriculum on the topic of your choice. You name the topic, and we will find the resources to help you learn about it. We’ll even create a loosely structured lesson plan for you, and send you personal reminders to make sure you stick with your educational goals. Contact us for rates! Technology workshops – If you are part of a group that would like to learn more about technology tools to enhance your group’s effectiveness, performance, or cohesiveness, get in touch! We can plan workshops from 1-8 hours to help bring your skills to the next level. Strike Debt Austin is a regional chapter of the national Strike Debt movement. We advocate for the creation of a union of debtors, especially amongst those who are struggling with student loan debt. 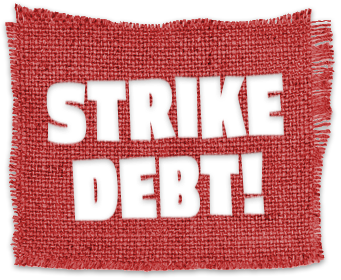 Strike Debt is a nationwide movement of debt resistors fighting for economic justice and democratic freedom. Debt is a tie that binds the 99%. With stagnant wages, systemic unemployment, and public service cuts, we are forced to go into debt for the basic things in life — and thus surrender our futures to the banks. Debt is major source of profit and power for Wall Street that works to keep us isolated, ashamed, and afraid. Using direct action, research, education, and the arts, we are coming together to challenge this illegitimate system while imagining and creating alternatives. We want an economy in which our debts are to our friends, families, and communities — and not to the 1%. You are not a loan. When I first thought of teaching geography as a fun summer course, I came across Little Passports. This curriculum sounded fun, but unfortunately gets a little pricey when you are dealing with more than one child. Their program is well designed, but not all of the aspects fit my children’s needs. I decided to keep the basic concept and push it to the limit! I’m kind of known for doing things backwards. This is fine by me, because I feel pretty content with my life even though I’ve probably been “doing it wrong” all along. When I decided to start a small business in the realm of educational services, I figured the best way to deal with the ramp-up time and demotivation that can occur when embarking on such a daunting journey was to include potential allies and clients in the process and use my experience as a new entrepreneur as a teachable moment…or, more likely, a teachable process. I encourage you to feel free to jump in and share your experiences as a small businessperson, entrepreneur, or self-educated individual. Or tell me I’m doing it wrong.